Why always go south for the summer? Lapland has quite a lot to offer in winter! Ride through snow-covered forests and hills and later relax by a fire in a goahti (Sami hut) while listening to Sami tales. How about ice fishing in the mountains? In winter you can observe reindeer, elk and other animals coming into the valleys in search of food. 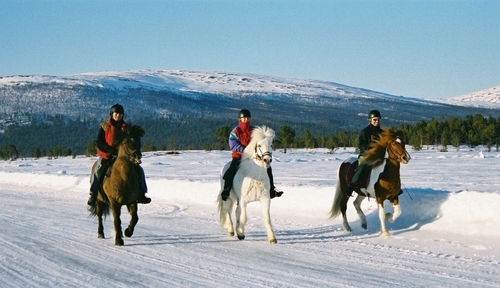 Overnight in Poulsta is spent on the same farm as the horses where you will enjoy traditional Finnish dishes. On clear nights you may be able to see the fascinating northern polar lights. Day 1: Arrival and pick-up in Kiruna in the afternoon. You will go on your first ride to the wonderful countryside. In the evening by the campfire your guide will tell you all about the Sami culture. 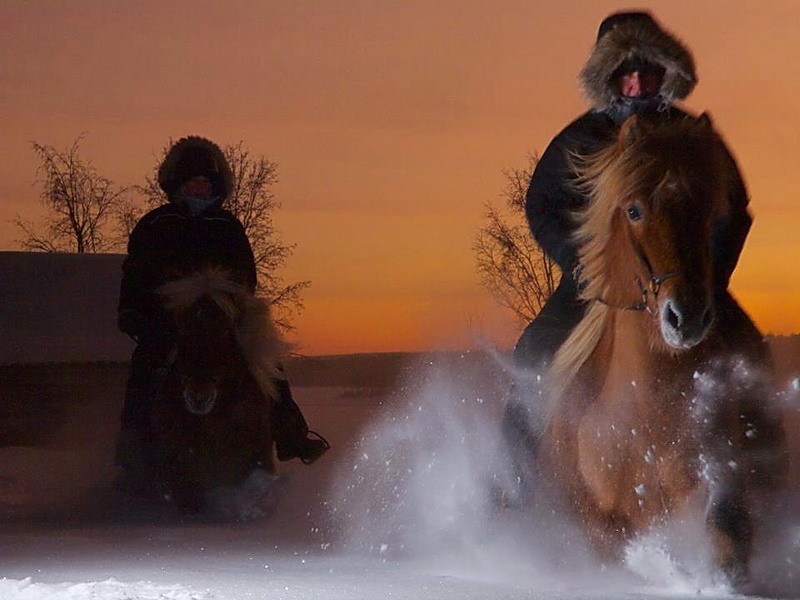 Day2: After being instructed in the traditional Islandic riding style you will take off on a ride through the marvellous winter landscape. Day 3: Today is dog-sled-day. Later on you can observe the reindeer on the farm from up close, feed them and even try to lasso them. After a long day of fresh air enjoy the hot sauna. Today you drive in a reindeer sled..
Day 4: There will be riding lessons in the morning where you can learn how to ride on ice! In the afternoon we will visit Kiruna and the famous Icehotel. Day 5: TodayŽs trail ride is longer and we will eat lunch en route. We may actually see reindeer and elk. Day 6: Have fun riding a snowmobile into the mountains and try your luck ice fishing. You will have a Sami guide who knows all there is to know about the nature and wildlife. In this short program you will get to know various winter activities. You will ride through the enchanting landscape and learn to read animal tracks. 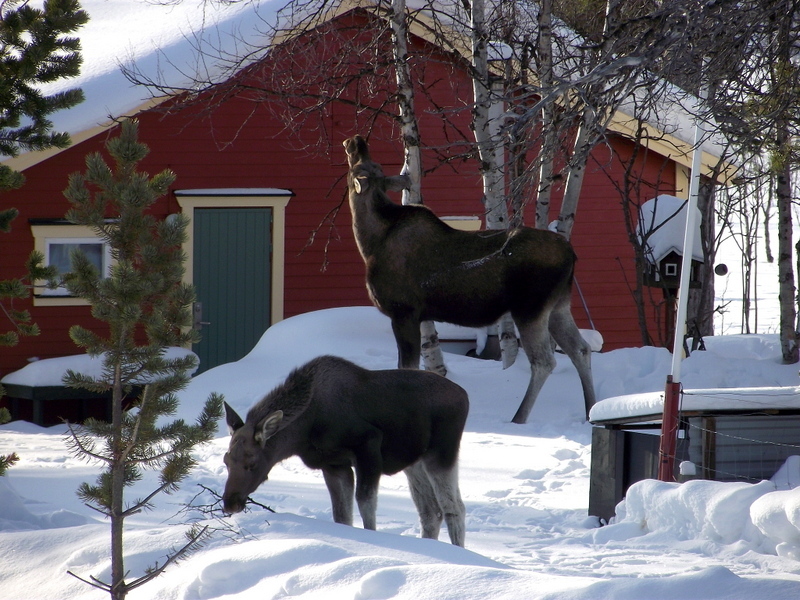 With a bit of luck you may see reindeer, elk and other wildlife. Also included is snowmobile riding and ice fishing. There will be a visit to the famous Icehotel and a cozy evening by a campfire in a goahti (Sami hut). Day 1: Arrival in Kiruna in the morning. Transfer to the farm and lunch. After eating you will dress warmly and go on your first ride through the woods. Possibly you will see reindeer and elk. The evening hours are spent in a goahti eating by the fire side. Day 2: Today is dog-sled-day. Later on you can observe the reindeer on the farm from up close, feed them and even try to lasso them. After a long day of fresh air enjoy the hot sauna. Day 3: Have fun riding a snowmobile into the mountains and try your luck ice fishing. You will have a Sami guide who knows all there is to know about the nature and wildlife. Day 4: Visit to the famous Icehotel!Transfer to Kiruna after lunch. ((Changes in activities possible due to weather conditions) By-the-way: Average tempeature is around -10 and -20 degrees. But since the air is very dry it does not feel that cold. However dress warmly. Riding caps and warm outdoor equipment can be borrowed. Eine Übernachtung vor/ nach dem Reiturlaub im Eishotel in Jukkasjärvi unweit von Kiruna macht Ihre Reise nach Lappland perfekt! Horses: You will be riding strong, sure-footed Icelandic horses. The terrain calls for a slower pace although there will be some opportunities to gallop and "tölt"(running walk)! Riding level & experience: all levels, including beginners. There are several other activities besides riding.